The most powerful ½ inch impact wrench on the market. Period. 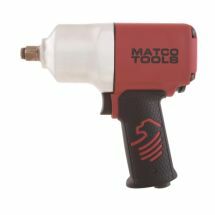 Matco Tools MT2769 Composite Impact Wrench offers technicians the most powerful 1/2 inch impact wrench on the market with a best-in-class breakaway torque of 1,300 ft. lbs. Plus, an exclusive easy-change muffler design allows for effortless servicing and sound level adjustment.